This Fantasy Sports Glossary is divided into 2 parts. The terms, lingo and jargon for the language of sports fantasy engages and unites the participants in a common language for fun and profit. gamerisms provides this glossary as a required tool and learning experience to both new FS players and grizzled veterans who want to expand their knowledge of fantasy sports. Lets begin the fantasy sports glossary with money terms, of course. 50/50: A contest event in which the prize pool is split evenly among the top 50% of the entrants. The amount of cash won by each person is slightly lower than double the entry fee. $/Point: Term for Dollars per point is the number of dollars each projected point costs. To determine the $/point, you would divide the player price by the projected points. You want to keep this number low in order to pay the least amount of salary possible for each point. The opposite of $/Point is Points/$ that follows. Points/$: Term for Points per dollar is the number of projected points per each dollar of salary. You want to keep this number high in order to take full advantage of projected points for every dollar you spend. ADP: refers to average draft position that reports where players are being picked in fantasy drafts. A helpful resource to determine where players are expected to go when draft day arrives. Auction Draft: refers to a draft system in which team managers bid for players. Each manager is given a specific amount of cash and builds the lineup/roster without exceeding budget. Bench Players: lingo for those players ‘sitting it out’ of the starting lineup. Blind Bidding: system used in many leagues to protect against cheating. This system permits teams to submit bids on players without the knowledge of bids from other teams. After all bids are in, the highest bidder gets the player. Bust: lingo for a particular player that does not play to his/her estimated potential, but rather performs below that level. Cash Games: if you want to play it safe, these games like Head to head, 50/50s, and double up league types are typical cash games. Keep these in your play book to increase your daily profits. Otherwise, tournaments are the opposite of cash games. Cheat Sheet: jargon for rankings guide – the short version - put to good use during fantasy drafts. Ceiling: is the tops or upside relating to the results of a player, team or lineup. Good news all round as opposed to the bad news of Floor. Contrarian: lingo for a rebel or maverick that picks players others would pass up. If picked correctly, you have just created a valued selection for tournament entry. Well done! Deposit Bonus: term for % of monies matched by daily fantasy site placed in your account for use in play. Depth Chart: term for a listing of players by team, position and rank. DFS: abbreviation for Daily Fantasy Sports. These contests are frequently offered online. Donk: lingo for donkey player as one who makes bad selections with little or no playing strategy. Also known as a Fish. If you are here, that will not be you! Double-Up: winners double their entry fee and congrats to you. Draft: special event where Fantasy owners alternate in selecting players for their team. Draft Guide: term for fantasy owners’ resource offering upfront info to include rankings, articles, depth charts, etc. in preparation for the fantasy football season. Dynasty League: term for a league that maintains rosters from season to season. Entry Fee: also known as the buy in. The amount of money you must pay in order to enter a contest that includes the rake collected by the daily fantasy sports site. Not all entry fees apply as there are some free public leagues. Exposure: refers to the $ or % of your bankroll invested in a player.It is good strategy not to invest too much on one player as the increased exposure also brings on increased risk. FA: refers to Free Agents are players that can be found in a general player pool that are not on anyone’s roster. In some leagues FAs can be added as need as long as you drop someone of your current roster. In other leagues FAs must be purchased or lobbied for and assigned to the highest bidder and you still would have to drop someone on your current roster back into the Free Agent pool. Fade: refers to the strategy of steering clear of a certain players. The reasons range from players who appear to be bad value or otherwise heavily owned or you prefer the contrarian route. Fantasy General Manager/Owner: term for the Big Boss and main decision maker for drafting, trading, dropping, setting lineups, etc. Fantasy League: term for a group of owners in competition for the championship. Fantasy Sports Games: Football is the most popular. 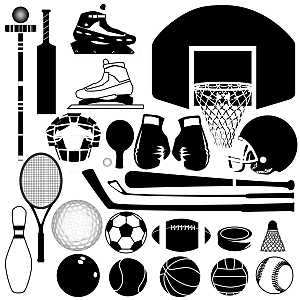 Other fantasy sports played are baseball, soccer, basketball, hockey, golf, NASCAR and MMH=Mixed Martial Arts. FFB: fantasy sports glossary abbreviation for Fantasy Football, arguably the most popular fantasy sports games. FPPG: refers to the average number of Fantasy Points Per Game scored by each player. When you draft a lineup, you can rank players by their FPPG scores. Doing so will help you to identify those who may be on streaks. Most formulas used to value players take this number into account. This levels the playing field for injured or suspended players who haven’t played every game. Fish: lingo for inexperienced or poor player open to those nasty sharks seeking an opportunity. Also see Donk. Floor: is a ‘downer’ or worst of the results of a player, team or lineup. Bad news all round as opposed to the good news of Ceiling. Freeroll: term for a contest that does not require an entry fee to participate. Some freerolls offer real money prizes to the winners. Others provide free entry into contests with relatively high buy-ins. Still others are just for fun; there are no prizes. Game Versions: term for types of contests offered by daily fantasy sports sites. They include H2Hs, 50/50s, qualifiers, multipliers, and guaranteed prize pool (GPP) contests. GPP: term for Guaranteed Prize Pool. It is a type of tournament for which the daily fantasy sports site guarantees a specific prize pool amount to be divided among the winners. The prize pool is generally large as is the number of entrants allowed to join. Grinders: lingo for a daily fantasy players who are in the game for increased profits over time. These players seek out safe cash games with a steady as you go attitude. H2H: refers to Head-To-Head, a type of event in which there are only two entrants. The winner of the match-up takes the prize pool, less the rake. Hedge: as with casino games, this strategy reduces your risk with a back-up plan. For example, to offset bankroll losses, you might hedge with a second lineup with different players.